Refilling toners with TonerTopUp refills cheaply replenish your laser cartridges. Toner refills for laser printers, fax machines and copiers from the UK. We supply bottles of toner and laser printer refill kits to make refilling cartridges easy. Laser toner cartridges can be simply refilled several times to save you money. Environmentally friendly! HP Hewlett Packard Brother Canon Epson Lexmark Konica Minolta QMS OKI Samsung Xerox laser refill toner and many other types! Toner refills will slash your print costs! Buying toner refill kits and refilling your laser printer cartridge saves money. Replacement printer cartridges are expensive, sometimes more than the cost of the printer. You can fill your cartridge with a bottle of our refill toner and save up to 87% of the cost of a replacement cartridge. Laser cartridges can be reused many times, but the manufacturers don't want you to. That’s how they make their huge profits! How much will toner refills save you? Well that depends on what printer you have and how you are currently buying. We can normally save new clients around 50% on the cost of their printer cartridges. What printer do you have? Click the link below to order! You can refill fax and photocopier toner cartridges too! It's easy to refill your cartridge! Don’t scrap it. Revive it with fresh toner powder! Unplug and pour! - For some laser printers, fax machines and copiers topping up with toner is as simple as removing the filler plug or opening the shutter and pouring it in with our special funnel! Unscrew, unplug and pour! - Others have a few screws to undo first before you reach the filler plug. Melt hole and pour! - Some manufacturers make it a little harder and you need to melt your own filler hole in the cartridge using our special tool. It takes seconds and thereafter the cartridge is easily fillable. It is quick and mess-free! DIY refilling takes just minutes. We provide everything you need for a quick, mess-free, professional job. Our funnel top seals onto the bottle making it easy to pour in the contents. Instructions We provide specific, step by step instructions for most models. Pictures show how to access the existing filler hole or where to make a new hole in the cartridge. They include information on preparing your work-surface and handling the powder without mess. Specific instructions are provided for most toner refills. Read general instructions for toner refills here! Yes, of course it does! The great thing about filling up with powder is that you don’t disturb the inner workings of the cartridge. If it was working well when it ran out, then filling will revive it. Read what our toner refill customers say! Typically, a new or remanufactured cartridge will last for at least another two fills before you lose quality or something goes wrong. It depends on the type. Those which do not contain an imaging drum will often last for 5 or more fills. Read a toner refill case study! All of our powders are specifically formulated for the models for which we supply them. They have been fully tested. We guarantee that they will not damage your printer, neither will they void your warranty! The first time you fill, the quality should be the same as when it ran out. By reusing your cartridges, you remain in control of the quality of your print. Components in the cartridge will degrade or fail in time, and you can decide yourself when the time has come to start with a new one. Any unused powder can be used in another cartridge so there is no waste. Reduce, reuse and recycle is the environmental mantra! Approximately 44 million laser cartridges are bought each year in Europe. In the UK 95% of these are thrown out after only one use. Each cartridge contains between 1 and 2 litres of oil, as well as aluminium and steel. Each time you reuse a cartridge, you save these valuable, non-renewable resources and the energy required to manufacture the cartridge. The majority of laser cartridges are disposed of in landfill sites. In the UK this amounts to 10,000 tonnes of material each year. The plastic and other material in the cartridge is non-biodegradable. It does not decompose for many centuries. Each time you reuse a cartridge, you save waste landfill. If all of the cartridges thrown into landfill in the UK were refilled once we would save 15 million litres of oil within 12 months. For a fuller discussion of the environmental issues! Do you change your car engine when you run out of petrol? Ever thought why you change your cartridge when it runs out of toner? It's not because you need to, it's because the manufacturers tell you to. The profit on sales of supplies over the lifetime of the printer is usually far more than the profit on the printer itself. Reusing toner cartridges is equivalent to filling your car with petrol, only you cannot do it so many times. We believe that we have the largest retail range in the world! We supply over 1800 products for over 12,000 models. These range from old printers that are still in use, like the original Hewlett-Packard Laserjet, to small, modern desk lasers, like the Samsung ML-1660. We supply products for high volume A3 printers from the old Canon LBP-WX to the new colour Xerox Phaser 7500 and for colour multifunction printers like the Brother MFC-9320 CN. If we can get it and save you money, we will stock it for you! Reset required? Many cartridges must be reset so that the printer recognises the new supplies. These have a chip or fuse that shuts down the empty cartridge. We supply replacement chips or fuses, or provide reset instructions for most of them. A small selection of our wide range of products! Our products are used by a wide range of customers. These include schools, university departments, estate agents, photographers, industrial users, commercial printers, direct mail houses, publishers, marketers, restaurants, and other businesses large and small. We also supply to charities, churches, social organisations and many individuals. "Thank you for your prompt delivery of the toner, which I received today. The refilling of the cartridges worked out without any problems and the prints look perfect. I appreciated your friendly communication and the very well structured website which makes navigation and ordering very easy. I can only recommend your products and services. " "Thanks for the toner top up. It arrived promptly and was easy to do. The melt and pour starter kit was fantastic. It was all inclusive, I couldn't have asked for more." "Can I take the time to thank you for your considerate service and that your product was a breeze to use and gives as good a result as the original. I will continue to use your products and will endorse them to others that I may make contact with. Read more of what our customers say! Welcome to our visitors from overseas! Many of our visitors are from North America and we routinely ship there as well as to many other countries around the world! From Australia to Iceland, from Malaysia to Iraq, and to most of Europe as well! If you are located outside of the United Kingdom, then our Shopping Cart is configured to calculate the shipping cost appropriate to your country. Please select your country from the list in the Shopping Cart after you have selected your items and then click on the "Update Country" button. The shipping cost is calculated on the shipping weight of the items chosen. If you are in the EEC, you will have the option to enter your local Value Added Tax* number so you do not pay the UK Tax. If you are outside the EEC, then no tax will be added. More detail about overseas shipping. We suggest you challenge us to save you 50% on the cost of your printer cartridges. Go on! Send us a list of the models of printer you have and what you pay for the cartridges now! We will do the rest! We accept official purchase orders. On the website select your items and choose the cheque payment method. Include the official order number, if you have it, in the comments section. The system will produce a pro-forma invoice for you to print out. You may send this with an official order by post if you prefer. We offer discounts on request to those placing large orders. Generally these will start for orders worth £500 or more. Do contact us and discuss your requirements. We supply resellers around the world on special trade terms for volume purchases. Contact us now! For certain printer models the OEM formulations are very similar and a Universal toner works well across the entire range. We now supply 1 kilogram bulk bottles of Universal toner for many older monochrome printers. We have different universal formulations for Brother, Epson, Lexmark, HP, Kyocera, Samsung and Xerox printers. Whilst providing the most economical way to refill, due to variations in original formulations the Universal Toner may not match the print quality of our specifically formulated powder in some cases. They are not available for the most recent high speed machines that require a dedicated high speed powder. With the exception of HP and Brother nearly all printers manufacturers nowadays put killer chips on their cartridges. These are designed to stop you from refilling. They record the usage of the cartridge, detect when it is refilled then lock out and stop you printing. You must replace the chip as well as refill the toner to reset the supplies level and page counters so your refilled cartridge appears new. We stock a wide range of replacement chips for many cartridge types. The chip technology is becoming ever more complex as OEMs battle to protect their supplies market. It can take several years for chips for the latest models to be developed due to heavy encryption and other complex digital wizardry. We aim to release the new chips quickly once they become available. In addition to the complex technology the OEMs are releasing firmware updates for their printers. These "updates" are designed to stop aftermarket chip solutions from working by changing the encryption keys used. The printers can install these updates over a network internet connection without permission from the user, so you may find you have updated firmware without even knowing. This is another weapon they are using to block out the aftermarket and gain a monopoly on cartridge supply. If you are prompted to install a firmware update be sure to say no. We try to source new batches of chips compatible with the latest firmware as soon as they are available. If you we supply a chip that is rejected by your firmware we will try to replace it with a working chip. In some cases when an update has just been released there is a delay before we can source the updated chip. Many printer models use separate OPC imaging drum cartridges. The drum cartridge is set to lock out when its rated page life is reached. This is controlled by a chip or fuse. By replacing the chip or fuse you can reset the page count to zero and continue to use the same drum for another cycle. The print quality is usually still good and by reusing the drum you can decide for yourself when a new one is needed. Drum chips and fuses are harder to source than the toner chips, so we have a limited range in stock. If we do not stock it for you model and you would like us to investigate further please contact us. Many printers have a hidden maintenance mode where you can reset the consumable page counts to zero without having to replace the chips. The information on accessing these hidden modes is hard to find, so we have it for a limited range of models. Where this information is available we include it in the instructions that come with the product. Back in 2006 our company founder Mr Martin Young made a short video to promote the cost savings and environmental benefits of refilling. Martin's background was in professional printing using large litho presses. He started refilling his own HP Laserjet 4000 printers that were heavily used, making large savings whilst maintaining high quality output. Whilst cartridge designs are now more hi-tech and usually require chip replacement, the fundamentals of recharging remain the same. A key point to note is that the manufacturer has to guarantee the print quality of a cartridge up to the end of its rated page yield. As it can potentially be used to print single page print jobs at 5% toner coverage, it has to work perfectly at the end under the highest wear conditions. Cartridge wear depends on the number of drum revolutions. If you are printing a single page the printer goes through a start-up cycle, prints the page, and then goes through the slow-down cycle. The additional time and turning incurred during the start-up and slow-down cycles increases wear of the components inside your cartridge, leading to lighter printing and increases the likelihood of developing defects. While no printing is occurring, the components in your printer and cartridge spin just as if something was being printed. So printing longer multiple-page print jobs and using higher toner coverage per page extends cartridge life. A typical user is doing some longer print jobs, and using coverage greater than 5%. This is especially the case when printing photos and graphics where coverage can be as high as 50% (so one tenth the number of pages go through the cartridge). Because of this phenomenon a typical empty cartridge still has plenty of life left before internal components become worn. Typically between two to four refills are possible for an all-in-one type cartridge with the imaging drum built in. When the print quality no longer meets your accepted standard it is then time to start a new cartridge. The CTSCs are specially designed for refilling. It is very easy and clean, just like replacing a new one. They have a filler opening so there is no need to disassemble the cartridge or melt a hole. Simply pour more powder in. No tools required and no mess. With CTSC there is no need to empty the waste powder or replace the chip. Simply pour more toner inside. The bottles have a foam seal so there is no leakage. The CTSC give optimal environmental protection benefits. They are super durable and can be used 6-8 times. Available for a range of HP and Canon models, they are supplied with five refill bottles - equivalent to six replacement cartridges. Supported cartridge numbers are HP: CF279A, CF283A, CF283X, CE285A, CB435A, CE278A, CC388A, CB436A, Q2612A, Q2612X. Canon: FX9, FX10, CRG-737, CRG-725, CRG-712, CRG-726, CRG-728, CRG-713, CRG-703 Europe region and their equivalents for other regions. Record the action, whilst enjoying the action! If you are interested in photography and outdoor activities, then an action camera could be for you. Capture crisp and colourful full HD video, and beautiful photos in a small lightweight camcorder that goes anywhere you do. Mount to your helmet, bike or surfboard. It comes with a waterproof case and WiFi remote control. Easy to use, you can set photos to roll in the background whilst you do your sport. Complete with LCD screen for framing and checking your shots. High performance ceramic dry wax chain lube! Ride-Right products are the first choice of the cycling enthusiast. Enjoy the feeling of riding in the sunshine, happy and free. Fall in love with cycling with our high quality, performance lubes. Our unique products range include bicycle chain lubes, fork stanchion oil, ceramic grease, brake mineral oil, dry moly spray and anti-mist for glasses and goggles. Top up your cartridge with our high quality toner refills and you will give it a new lease of life. After all, you don't scrap your car when it runs out of petrol, do you? Most cartridges can be filled several times before essential components begin to wear. We aim to provide the lowest prices available for toner refills and chips of equivalent quality. We also offer special offers based on the quantity you order. If you are interested in placing a large order or have found a product cheaper elsewhere please phone on 01732 750364 or email us at sales - at - TonerTopUp.co.uk and we will give you our best offer. 20% discount on any 10 bottles or more of any one mono printer toner. Please note that this offer does NOT apply to toner for colour printers. 10% discount on any 2 sets or more of colour toner. Each set contains one of each of the four colours cyan, magenta, yellow and black. The cyan, magenta and yellow can be substituted for each other if you wish. Now only £9.70 plus vat each for the Colour toner refills. Sized for the high capacity 4,000 sheet Colour cartridges. The reset chips are £4.00 plus vat each. Find out more about our range of colour toner refills. Use of colour laser printers is growing rapidly. With four colours and lots of pictures a lot of toner is used. The savings from DIY filling can be large. For many models we supply micro-fine "chemical" toner like the original branded supplies. This is a new type of product which is manufactured by polymerisation in solution and not by the traditional process of grinding of the fused ingredients. The resulting fine, even and spherical particles ensure high resolution, with optimal efficiency and brightness. Since colour and finish can vary, we suggest that you test to your satisfaction one bottle at a time. As with all our supplies we guarantee that the powder will not damage your printer and you may return unopened bottles for a refund. The development and testing of compatible supplies and chips is a complicated and expensive process. It is only undertaken for the more popular models and can take some time. We aim to make powders and chips available as soon as they are released. If a product for your model is not in our database or shown as not yet available, please contact us anyway. We will save your enquiry and let you know as soon as a compatible product is released. We use Sage Pay for secure credit card payments. We never see your card details. You may also pay by Paypal, cheque or bank transfer. if you prefer not to order online you can also phone, fax or email us your order. We do not store your card details if you give them to us over the phone. We aim to despatch all orders on the same day when payment is received before 3:30pm and it is rare that we are out of stock. Standard UK delivery is by 1st class Royal Mail letter post. About 94% of these orders arrive on the next day. Special Delivery is avaliable for a surcharge if you want guaranteed next day delivery and full compensation in the case of loss or damage. For large orders standard UK delivery is by next day courier. Standard delivery is free for all UK orders over £30 plus Vat. These popular models are easily filled many times. Our product is tried and tested. One of the most popular small Colour laserprinters available. Easy to refill with our "Unplug & Pour" method. High capacity cartridges CLT-70C2HK0 4,000 pages Black and 70C2XC0, 70C2XM0, 70C2XY0 3,000 sheet Colour. A replacement chip must be fitted and this fits in a plastic chip holder. Our premium Chemical toners are only £9.70 Black and £8.70 Colour a bottle (+ VAT). Cartridge TN-2220 2,600 pages. This small cartridge is used in Brother's most popular monochrome printers. It is easy to top up by removing the toner filler cap on the side. The specific instructions have pictures showing how to reset the Flag Gear, and how to convert the Starter Cartridge to high yield. They also explain how to empty out the waste and why this is necessary. As there is a separate imaging drum the same cartridge can be refilled many times with no deterioration in quality. Graphics toner is £6.70 a bottle (+VAT). We want our customers to come back to us time and again and so we do our best to support you in every way we can. We guarantee that our bottled toners are specifically qualified for the models for which they are sold and will not damage your printer. (does not apply to Universal toners). We accept back unopened bottles for refund without question. We respect your privacy and hate spam. We will only ever use the contact information you have given us to contact you when we believe it is in your own best interests. Read our full warranty and policy statements. Fund raising for your favourite charity or club? A business income for you? We offer a new Affiliate program for those interested in earning commission by promoting our products. Read all about it and sign up here as an affiliate! 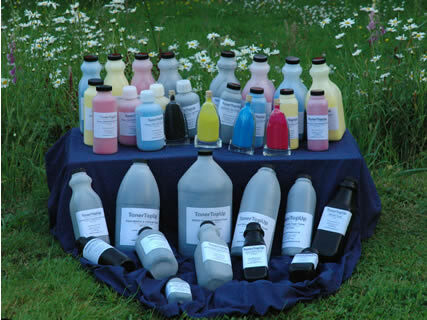 We are pleased to release a new range of Universal Chemical Colour toners. These are available for HP, and Samsung machines. These OEMs use very similar formulations across their colour ranges. These are genuine "Chemical" toners. Made by solution polymerisation the particles are uniform and spherical in shape. This gives high resolution, bright colours, glossy finish and efficient transfer to the paper. Conveniently packaged in bulk 1kg bottles (except Samsung that are smaller) we beleive this is the most cost effective Chemical colour powder available on the market today. In recent years the market has become flooded with low cost compatible cartridges from the far east. Many of these give excellent quality results equivalent to the OEM cartridges at a fraction of the price. This has reduced the savings possible from refilling your own cartridges with our kits. However In most cases you can still make significant savings from refilling. You are also helping the environment by saving raw materials, energy and waste landfill. If you find you cannot make a significant saving with our products please contact us and tell us the price you are paying for your cartridges. We may be able to adjust our prices to make refilling worthwhile. White toner is used for printing onto dark coloured textiles and other materials via transfer paper. The other colours can be overlayed onto the white to produce a colour graphic on a bright white background. We now stock 250g bottles of original Oki white toner for professional quality results. This specialist toner is more expensive to manufacturer than other colour formulations. It is compatible with all Oki white printers. The same white toner can also be used with many non-white Oki colour printers. It is possible to convert the non-white machines to print white using specially converted drum units. We recently reduced our prices to their lowest level in response to strong competition from compatible cartridges and eBay sellers. The compatible toner we supply remains premium quality with comparable results to the original formulations. There is no better time to refill your cartridge and experience high quality, eco-friendly printing at a fraction of the price of the branded supplies. Ferrofluid is magnetic liquid. It was originally developed by NASA to control the flow of liquids in space. The shapes and flow of ferrofluid show how magnetic field lines curve around magnetic objects. It is interesting and beautiful to see. You can make your own ferrofluid for science and art displays. You need very fine iron, or iron oxide particles. MICR toner for ferrofluid is the most convenient source. Magnetic Ink Character Recognision (MICR) toner is a specialist product used for printing cheques. We supply MICR toner for ferrofluid in 595g bottles.